A new Smart bandage has been developed by scientists at Tufts University that can monitor how chronic wounds are healing and can deliver antibiotics and other drugs directly to the wound site on demand. The bandage contains sensors that measure the pH and temperature with the readings passed to a microprocessor in the bandage. The antibiotics are added to a thermoresponsive gel and will only be released when the gel is heated to a specific temperature. When the pH of the wound falls outside of the normal range of 5.5 to 6.5 or the temperature rises, both indicators of a bacterial infection, the microprocessor will send current through heating elements that trigger the release of antibiotics. The bandage is only 3mm thick and contains flexible components that allow it to follow the contours of the skin. The bandage is held in place with transparent medical tape. 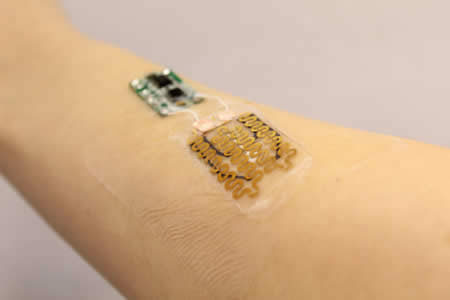 The smart bandage is low cost and the most expensive component – the microprocessor – can be reused. At present, the prototype only contains two sensors, although the scientists report that other sensors could be incorporated into the smart bandage to measure the level of oxygenation. Biosensors that can detect specific biomarkers could also be included. In addition to antibiotics, other drugs could be incorporated into the smart bandage such as anti-inflammatory drugs or growth factors which could be released in response to different healing markers. The smart bandage could be used to treat chronic wounds such as those caused by diseases such as diabetes. The bandage could also be used in the treatment of burns. Chronic wounds are prone to infection and infection of chronic wounds is the leading cause of non-traumatic limb amputations. The ability to monitor for infections in real time means antibiotics can quickly be administered to the site of the wound to help with the healing process. Many patients with chronic wounds are non-ambulatory and can have trouble administering treatment themselves. The smart bandage would therefore be particularly useful to ensure these patients receive timely treatment without having to be visited by care workers. The prototype smart bandage has been tested in vitro and preclinical testing is now underway.